It was here that the Buddha announced the approaching of his Mahaparinirvana. During one of his visits here, the Buddha was offered a bowl of honey by a monkey. This incident is mentioned as one of the eight great events in his life. Vaishali is 60 kms. From Patna, connected by the 5.5 kms. Long Mahatma Gandhi Bridge. This city hosted Lord Buddha five years after he had attained enlightenment. The mass induction of people into Buddhism after the Lord had shown some extraordinary and divine presentations of his spiritual superiority is the major reason for the popularity of this place. On arrival of the Lord, the then rulers, the Lichhvis offered a grand welcome to the Lord who denied all luxury offered to him. The magnificence of his personality and the pristine values immediately started showing effect on the citizens and it is believed that at that period of time eighty four thousand people had adopted Buddhism. Vaishali is also important for the matter that here, for the first time, women were inducted into the Sangha. Gautam's (Buddha's childhood name) foster mother Mahaprajapati Gautami had also joined the order at Vaishali with other 500 Sakya-women. State : Bihar, in east of India. 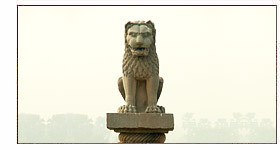 Ashokan Pillar - The magnificent ashokan pillar with a lion adorning its top is a definite crowd-puller. This 18.3 m high pillar is made of a single piece of red sandstone and is a major attraction to the tourists. Fort Vishal - Fort Vishal is a one kilometer long fort and is known to be the part of the oldest democracy of the world which had housed the parliament of those times. 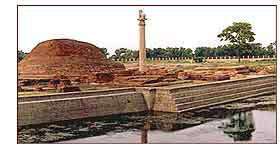 Museum - The museum houses a rich collection of antiquities discovered from various sites in Vaishali. Bawan Pokhar Temple - This is an old temple built in the Pala period. It is situated in the bank of a tank known as Bawan Pokhar and houses beautiful images of several Hindu gods. Air - The nearest airport is Patna which is 56 km from the city. Rail - Hazipur is the nearest Rly. Station. Road - Regular bus services connect the city with Patna and other cities of Bihar. Rajgir - Situated on the district of Nalanda is Rajgir, an important Buddhist pilgrimage site where the first Buddhist Council was hosted after the Nirvana of Buddha. Patna - Patna was earlier known as Pataliputra, the capital of Magadh empire and is 55 kms from Vaishali. This is the place where the third Buddhist council was held. Kesaria - Kesaputta during the time of Buddha where, he preached that his sermons should be taken not as f granted, the place is known for the 104-ft stupa that is the largest in the world, even beating the Borobodur of Java. 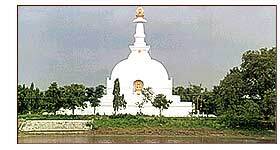 Originally a 123 ft high stupa, a major earthquake resulted the stupa to get immersed down in to the earth. According to General Cunningham the present stupa is built upon an earlier and much larger stupa that dates back to earlier than 200AD. It is also known that the Lord had spent a night before his Nirvana in Kesaria. The Lichhivis are associated to the construction of most of the monuments in the region and this stupa is no different.